Parasitic members of the Trichuris genus, commonly referred to as whipworms due to the whip-like body form of the adults, contain numerous species that affect a wide variety of mammals, including humans, cattle, rodents, cats and dogs. 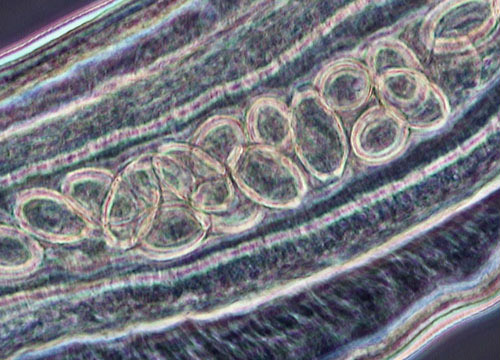 Over 60 species of Trichuris have been documented, and each has been found to undergo a similar life cycle. The adults thrive in a host's large intestine with their anterior end embedded in the cell lining to rob nutrients. 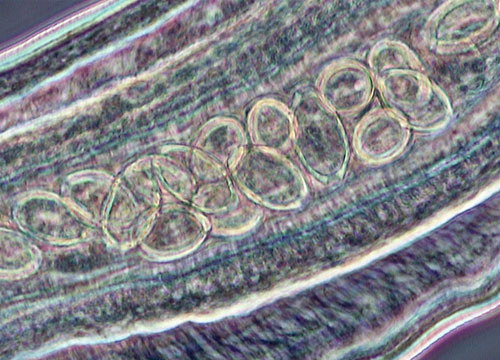 The parasite's exact lifespan is unknown, but they can live for several years. Females are capable of producing more than 10,000 eggs in a single day, which are passed out of the host's body with digestive waste and require a warm, moist environment to continue development into the embryonic stage. Infection is acquired through the accidental ingestion of eggs and embryos. Because these parasites do not actually multiply within the host, every individual worm inside a host represents an independent infection event. Trichuris trichiura is the species that infests humans. Symptoms of whipworm infection include anemia, pallor, abdominal discomfort, and dysentery. The intensity of symptoms depends upon how many parasites are carried, with individuals having only a few worms appearing to be wholly unaffected. Children are more prone to infection than adults and tend to suffer more severely. Extended infections of whipworms in the young may even cause mental and physical retardation.